I was born in Salt Lake City, Utah, and grew up there my whole life, in addition to some time in Michigan and Minnesota while my father was in medical school. I'm married to a lovely girl from Sandy, Utah. We've been married for almost a year now. I'm 23 and enjoy all sorts of things: sports, outdoors, learning, and spending time with family. You served a two-year mission for the Church of Jesus Christ of Latter-Day Saints (Mormon), right? Where? Brisbane, Australia - Mandarin Chinese speaking, 1997-99. It was hard - I won't beat around the bush. But, looking back, it was two of the most memorable years of my life. I had planned, going into my freshman year at BYU, that I would definitely go on my mission. So I did a year of school and then left for two years. This is no uncommon thing at BYU, so I thought nothing of it. I played rugby at BYU for that freshman year and then, as chance would have it, was called to Australia. We worked with Mandarin-speaking Chinese expatriates in Brisbane mainly, but also served the local Australians. Having that mix was quite an experience! Did serving a mission make you a better rugby player in any way? Being there for two years serving the Australians and Chinese not only helped me grow and mature as a person, but it also helped improve my rugby. We played touch rugby just about every day off we had; just being in a country where rugby is a part of the life taught me how it is a thing of culture rather than just a game. What are you doing now as an occupation? I'm a student going into my junior year. I'm majoring in philosophy and expecting to graduate in 2003 while working part-time to make the ends meet. I'm minoring in business and looking to go into the business world - whether with some company or doing my own thing (which is really what I'd like to do). Why philosophy? I chose because it's what I wanted to do - it's that simple. I like to think and like how it offers me a continual ability to learn, for that is what I'm going to have to do throughout my life no matter what my career is. Depends upon what time of year it is: finals week, the dead of winter or when school's out. I like it here, don't get me wrong. I think being here is a tremendous opportunity for anyone and I've considered it an honor to be here myself. Plus, when you have the opportunity to represent a school in sport that stands for what it does then it makes being here even more unique. When did you first discover rugby? In my freshman year. I was coming to wrestle and had things change in that department prior to coming here. So, in an effort to keep on doing something competitively my good friend Taylor Nadauld (also on the USA Collegiate All-American Team) suggested I go play rugby. He wasn't playing at time either, but all of his brothers were, so he offered that bit of prodding. I just showed up, made the team, then the 1st XV and it just went from there. What has your experience been like with the BYU side, highlights and lowlights? It's an honor to represent your country, of course. 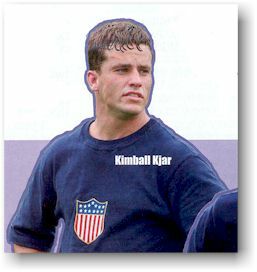 But since my rugby career exists mainly with BYU it was quite different standing in the red, white and blue. I was more anxious to be able to contribute on the field than I was to sit and wait for my chance to come. To be quite honest, I'm coming to recognize the magnitude of it all, but as for right now I still have some things to learn and experience with the Eagles. I hope to be a fundamental part of the team's progress in the future and it will be my goal to be such. What are your impressions about Eagle selection, practice, play, strengths, areas for improvement, etc? Eagles selection is something that is hard to do; I don't envy the job of the national selectors at all. Given the sheer size of America and the relative amateurism of the sport here, it's hard to get to see everyone and be able to confidently select your best team. But I do believe the coaching staff as well as the selectors have the best jobs, given the hand dealt them, and selected the best team available to them. The practices are rigorous and very focused. The word that comes to mind is professional. They guys that are playing professionally offer a strong core of experience to which the younger players can build and learn from. I enjoy the opportunities to be with the team, as you can learn much from the guys experience and knowledge. The play of the Eagles is improving. I have seen things needing improvement, but will reserve spotting them out other than to say that American rugby needs to gain creativity and spontaneity. I mean that we need to be able to create opportunities through correct and timely assessment of opposition play and then, as a team, be able to attack those things that are given as weaknesses. This needs to be done in a way that is not only performed by doing the basics, but also by doing those things that are off-the-cuff but done in sound rugby judgement. Any thoughts about being only the second Mormon (after Mark Ormsby) to represent the US? I've never really looked at it that way. I'm more worried about BYU rugby and the state of Utah rugby than LDS rugby. But, I do recognize the fact that a player from BYU - or the state of Utah - might be LDS and as such should feel responsible to represent those values in a proper fashion. How about your recent selection as a top college player? I think the Collegiate All-American is a great honor as well. As the team has for years been a little-recognized USA Rugby program, this year I am excited to be a part of going to another rugby nation and representing American rugby. It's also a step forward for BYU rugby, as for years such players that easily could have (and should have) been selected for such teams never were chosen. I'm looking forward to go to Ireland with my good friend Taylor Nadauld. I think this selection puts an eye on our program and shows respect that has been absent for some time. I'm glad to be a part of it and will give my all in the same way as I plan to with the Eagles. What are your future plans (family, occupation, rugby)? I plan to finish here at BYU, and then it's sort of up in the air. I plan on going into business upon graduating while staying involved with rugby. My hope is to keep with BYU rugby and the Eagles until I graduate and then see what options there are (if any) to play overseas. I might even try my hand at that next year. My dream is to play professionally overseas, but no eggs are in that basket yet other than trying to do my best with BYU, the All-Americans, and the Eagles. 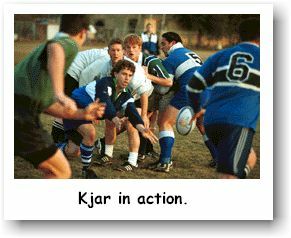 My hope is to see rugby at BYU receive the acclaim it so deserves, and that includes the players past, present and future as well as the coaches that have not only laid the platform for over forty years of success, but also the present coaches that continue to uphold and represent the values of BYU Rugby. I also would like to see to the progress of rugby in Utah, including high school rugby as well as collegiate and men's club rugby.